Some nucleophiles are added to carbonyls in the form of salts, such as sodium cyanide. In a salt, there is an anion and a cation. The anion can act as a nucleophile, donating a lone pair to the carbonyl. The cation is just a counterion; it is there to balance the charge but doesn't usually play an active role. Some anions are too unstable and reactive to be used as salts. This is especially true with a number of carbon nucleophiles. C-H bonds are not usually acidic enough to deprotonate with a strong base. That makes it hard to make a simple salt containing such nucleophiles. There are exceptions, such as acetylide or alkynyl protons like CH3CCH. In that case, the resulting anion is relatively stable because the lone pair is in a lower-energy orbital with more s character, so it is held more tightly to the nucleus. Less stable carbon anions can be be stabilized through a covalent bond. If the carbon is covalently attached to a less electronegative atom, the carbon has a partially negative charge. It can still act as though it were an anion. However, the covalent bond stabilizes the would-be "lone pair". Compounds like this can be considered to be "semi-anionic". Frequently, they are described as polar covalent compounds, although that is really a much more general term. These polar covalent bonds can be found any time a carbon atom is bound to a metal. 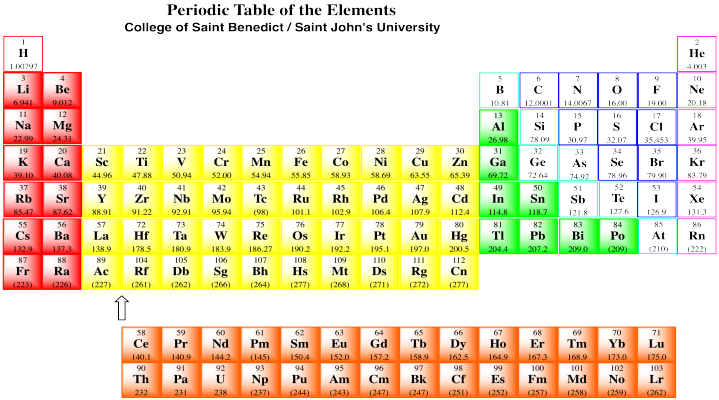 Remember, the metals are the aroms in the coloured boxes in the periodic table below. One of the most common classes of this type of compounds is the family of organomagnesium halides or Grignard reagents (Green-yard reagents). Victor Grignard was awarded the Nobel Prize in Chemistry for his development of these reagents. These compounds are made by reacting an alkyl halide (such as chloropropane, CH3CH2CH2Cl, or bromopropane, CH3CH2CH2Br) with magnesium metal. With bromopropane, the metal undergoes an insertion into the C-Br bond, forming CH3CH2CH2MgBr. (You don't need to worry about how this happens.) Because magnesium is less electronegative than carbon, the C-Mg bond acts as though it were a lone pair on the carbon and the magnesium acts as though it were a cation. What's striking about Grignard formation is that polarity is reversed in this reaction. In the alkyl halide, the carbon attached to the halogen has a partially positive charge, because carbon is further to the left than halogens in the periodic table. After magnesium insertion, this same carbon has a partial negative charge, because carbon is farther to the right in the periodic table than magnesium. This sort of reversal in reactivity is sometimes called "umpolung chemistry". At the extreme, we could think of propylmagnesium bromide as a propyl anion with a magnesium counterion. That picture really isn't very accurate; there really is a covalent bond between the carbon and the magnesium, which is what makes the compound more stable than if it were purely ionic. However, thinking of it as a propyl anion might help you understand its role as a nucleophile. Propylmagnesium chloride and other Grignard reagents can deliver alkyl nucleophiles to carbonyls. Just like with simple anionic nucleophiles, an alkoxide ion results. The relatively simple mechanism is shown below. The nucleophilic bond donates to the carbon of the carbonyl, breaking the π-bond, releasing a pair of electrons to the electronegative oxygen atom. Alternatively, you could still draw the bromine attached to a Mg+ at this point. Of course, subsequent treatment of the alkoxide with acid provides a proton, resulting in an alcohol. We can see the two consecutive reactions in the following mechanism. In that first step, there is no apparent lone pair involved. Instead, the polar magnesium carbon bond behaves just as if it were a lone pair on carbon. Remember, the order of these two steps is very important. Adding the acid before the Grignard reagent would not work, because the Grignard reagent would become protonated at the carbon. Although the Mg-C bond is covalent, it is still polar enough so that the carbon can act as a nucleophile or as a base. Once propylmagnesium has become protonated, it forms propane, which isn't likely to act as a nucleophile. Grignards can have a variety of structures, but they are almost always hydrocarbons, with no other functional groups in the structure. Other functional groups are frequently incompatible with the reactive metal-carbon bond. The same is true for the closely-related alkyllithium compounds, such a methyllithium,CH3Li. Other than that, Grignards and alkyllithiums can be saturated (containing only sp3 carbons) or they can contain double bonds. Show the products of the following reactions. Assume workup with aqueous acid after each reaction. Grignard reagents are very delicate. Solvents must be chosen very carefully for Grignard reactions. Grignard reagents are basic enough that they can't tolerate protic solvents. Protic solvents are solvents that are capable of hydrogen-bonding. Although they don't seem very acidic, they can still give up a proton to a strong enough base. A Grignard reagent is a strong enough base to take that proton from an O-H bond. Show why Grignard reagents cannot be used with ethanol as a solvent. In fact, Grignard reagents are even fussier than that. Not only do they not get along well with acidic or even semi-acidic protons, but they tend to need coordinating solvents to help support the magnesium atom and keep the complex stable. The most common solvents for this use are (diethyl) ether and tetrahydrofuran (THF). When two ethers bind to the magnesium, the magnesium has a full octet. Because coordination of magnesium by these weakly donating solvents is crucial, Grignard reagents can't generally be isolated. Instead, they are sold and used as solutions in ethereal solvents. The THF complex, like other coordination complexes, can be drawn in a number of additional ways. The drawing above is probably the most common type, but a couple of other drawings are shown below. In the drawing on the left, we are distinguishing between two slightly different types of bonds on the magnesium. One bond, which we have already discussed, is a polar covalent bond. It is shown with a straight line. However, we know the carbon behaves as if it were an anion with a lone pair. The other is a dative bond from a neutral donor. The oxygen is simply sharing one of its lone pairs with the magnesium. If the oxygen took its lone pair back, it would be a neutral atom. If the bromine left, it would be an anion. A convention widely adopted in coordination chemistry shows bonds from anionic donors to metals as lines, whereas bonds from neutral donors to metals are shown as short, straight arrows. On the other hand, if we know anything about formal charge, we would look at the picture above and correct it, giving the version below, right. Eventually, it will be useful to know that coordination complexes (or Lewis acid-base adducts) frequently form reversibly. There is actually an equilibrium in which donors come on and off the metal, especially if the donors are pretty stable by themselves. We can picture the propylmagnesium bromide swimming through the THF, swinging from one THF molecule to another. Of course, it is always possible that it bumps into another oxygen donor: an aldehyde or ketone. It would certainly coordinate to that oxygen as well, but the situation wouldn't last long as the nucleophilic addition would immediately ensue. The carbon-magnesium bond is polar, and it allows carbon to act as a nucleophile, donating its bonding pair to an electrophile. Other polar bonds behave in a similar way. Common examples include carbon-lithium bonds (which you will see in a question below), as well as aluminum-hydrogen and boron-hydrogen bonds (in complexes such as Na+ BH4- and Li+ AlH4-, also in a question below). Perhaps surprisingly, because both aluminum and boron are less electronegative than hydrogen, these bonds are polarized toward the hydrogen (carbon, just to the right of boron, is slightly more electronegative than hydrogen, although not enough to make us think of a C-H bond as polar). That means that these compounds act as sources of nucleophilic hydride ion, H-. Just like Grignard reagents, alkyllithium reagents and complex hydride anions are good nucleophiles for aldehydes and ketones. The nucleophilic part is donated to the carboonyl to make an alkoxide anion. Like Grignard reactions, these reactions are usually followed by treatment with aqueous acid (such as HCl or H2SO4 in water). The alkoxide ion picks up a proton to make an alcohol. The salts (including sodium or lithium ions) are washed away in the water. There are plenty of other semi-anionic nucleophiles. For example, alkyl lithium reagents are also very common, and they are prepared by treatment of alkyl halides with finely divided lithium metal. The reaction produces lithium chloride as a side product. a) Show an equation, with structures, for the preparation of butyllithium from 1-bromobutane. b) Explain what happens to polarity at carbon number one before and after this reaction. c) Why would the amount of charge on carbon number one be somewhat similar in butyllithium and butylmagnesium bromide? Another class of semi-anionic nucleophiles is the family of complex metal hydrides. Examples include sodium borohydride, NaBH4, and lithium aluminum hydride (LAH), LiAlH4. There are many other variations. a) Draw a Lewis structure for lithium aluminum hydride. b) Explain why LAH functions as a source of the hydride nucleophile, H-. c) LAH is much more reactive that sodium borohydride; it can reduce compounds that sodium borohydride will not. For example, it can reduce a nitrile such as CH3CN to an amine such as CH3CH2NH2 (after an aqueous workup). Explain why LAH is so much more reactive than NaBH4. d) Sodium borohydride is sometimes used in methanol, but care must be taken in dissolving the NaBH4. It doesn't just dissolve; it quickly reacts with the methanol to produce a flammable gas and NaBH3OCH3. Provide a mechanism for this reaction with arrows. e) Although NaBH3OCH3 also reacts with methanol, it does so much more slowly than NaBH4, and so it is still able to reduce aldehydes and ketones in methanol. Explain the difference between sodium borohydride and sodium methoxyborohydride in terms of reactivity with methanol. e) LAH cannot be used in protic solvents such as methanol. Explain why. Barbier reactions are a general class of reactions involving metal alkyls and carbonyls. Treatment of a halide such as propargyl bromide (HCCCH2Br) with zinc metal in the presence of an aldehyde such as benzaldehyde (C6H5CHO) results in nucleophilic addition of the propargyl group to the aldehyde. a) Zinc can insert into a carbon-halogen bond, just like magnesium. Show the product of the insertion described above. b) This reaction is usually performed in water with some ammonium chloride, NH4Cl, in solution. Show a mechanism, with curved arrows, for the reaction of the alkylzinc species with the aldehyde to yield an alcohol. c) Explain why this alkylzinc reaction can be conducted in the presence of water, but a Grignard reaction cannot. d) "Green chemistry" refers to the intentional use of processes that are better for the environment, by minimizing the use of toxic reagents and solvents. Compare the zinc-mediated Barbier reaction with the Grignard reaction in terms of "greenness". Semi-anionic nucleophiles do not just react with carbonyls. They are also frequently used to prepare organometallic compounds via "transmetallation". For example, treatment of tantalum pentachloride, TaCl5, with dimethylzinc, (CH3)2Zn, affords trimethyltantalum dichloride, (CH3)3TaCl2. a) Assume for the moment that tantalum pentachloride and dimethylzinc are both covalently-bonded molecules. What would you say about bond polarity in each case? c) In what ratio would you mix the two reactants to get these products? d) Show a mechanism, with curved arrows, for the formation of trimethyltantalum dichloride. e) Like some of the other compounds on this page, trimethyltantalum dichloride is remarkably pyrophoric: it catches fire upon contact with air. This behaviour often depends on weather and humidity. Show a mechanism, with curved arrows, for what happens when this compound is exposed to air. Provide IUPAC names for the following alcohols. For help, see the functional group section, simple heteroatomics. Fill in the missing intermediates and add curved arrows to show electron movement.